A nutritious meal of mussels can cause illness and even death when algal toxins are present. 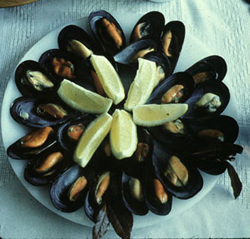 The consumption of shellfish (e.g. mussels, clams) is one of the most common ways for algal toxins to impact human health. In the U.S., state management programs are responsible for monitoring the concentration of the toxins in shellfish and closing the shellfish beds for harvest if the levels rise above dangerous limits. Marketable shellfish are generally considered to be safe, but in spite of these precautions, there are known illnesses. One dramatic incident occurred in 1990 when six fishermen almost died from eating mussels during a fishing trip on Georges Bank, a productive offshore finfish and shellfish area 100 miles east of Cape Cod, MA. After a hard day of fishing, the fishermen settled down in the ship's galley to eat a pot of steamed mussels that they had inadvertently caught in their nets. The Captain, who had joined the meal later than the rest of the crew, witnessed his fellow fishermen become incapacitated due to the paralytic effects of the toxin. He himself also became ill, but was capable of sending an urgent radio message to the US Coast Guard. The Coast Guard airlifted the men to the nearest hospital located on Nantucket Island, MA where they were treated using respiratory therapy to sustain their breathing and prevent them from dying due to paralysis of the lungs. Fortunately, all the men recovered and were back fishing within a few weeks. The event, presumably caused by a massive Alexandrium bloom transported offshore from areas along the northeast coast, closed the surf clam industry on Georges Bank to further harvest. Georges Bank is an offshore area too vast to monitor and is outside the states' jurisdiction, so the US government maintains jurisdiction and currently bans the harvest of surf clams which are known to retain the toxins for many years. James, K. J., Carey, B., O'Halloran, J., & Škrabáková, Z.